Copy it to USB or use SFTP to get it onto your other PC/Laptop. This is extremely important because you may need something to recover from later. Now we have to download the Coreboot sourcecode onto a laptop with a suitable Linux distro, using Git. Obviously we need Git installed, as well as GCC, Ncurses development, and iasl. From your home directory on this machine. Now we need to check and uncheck some options. I don’t list categories here for brevity. Just go into each section to find the options mentioned. Check Mark graphics memory as write-combining. Check Allow for caching system ROM. Check Add a VGA BIOS image. We change the “F12” to “F10” and “0x86” to “0x44”. Copy the coreboot.rom file in build to your Chromebook and write the file to your ROM! Many thanks to Ron Minnich, Aaron Durbin, Stefan Reinauer and Kyösti Mälkki, on the Coreboot mailing list. So yea I know this pre-build firmware is for series 5 which their processors are inter, but here is my question…If I downloaded your source code and compiled for Arm…Will it work for the series 3 ??? Can we just clear this up once and far all. Which model do you have? Is it the Samsung Series 3 ARM Chromebook *or* the Samsung Series 3 Chromebox? I think somebody in the community group managed to compile a ROM for Lumpy which is confirmed working. Take a look through there, it was fairly recent. Actually that raises a valid point, would you have an idea if trying to build coreboot for stumpy (Samsung Series 3 Chromebox) would be much different then this process? According to the SeaBios site, it is supported and also supported to use flashrom to install. Just can’t find a valid binary, so using your example to see if I can build one..
Actually there is now a ROM for the Samsung Chromebox (Celeron). The script on the ROM download page will flash it for you. John, you’re a star.. perfect… just need to disable the write protection and I’m gonna give it a shot. Have you managed to test installing Windows with it? Actually, while that is awesome, just realised it won’t work for me.. I haven’t got a Celeron based Stumpy, however I do have a Core i5 based on.. (Google I/O edition). Well, if you can tell me the PCI id’s of the graphics card, I’ll build one, and add it to the script. “lspci -nv” is your friend. Okay, that’s enough to make a ROM with. In fact, I already have one for you to try. Not sure if joke with name of rom, but thanks for your help so far. I take it you haven’t tried it yet? Gotcha, haven’t tried it yet, as jumper I foiled was the wrong one, so taking Chromebox apart to see if I can get the damn thing to be writeable.. have downloaded and verified the md5sum tho, and that all checks out. It’s one of two jumpers in the most inconvenient spot (info on Chromium site is wrong, not to mention the Stumpy doesn’t have a battery), however on the board, there are two jumpers on the top side. Gotta love lack of time, so sorry I can’t test it as quickly.. should have it done soon. Hmm, flashrom is still telling me this board is still disabled with it’s writes, and reading the flash gets a transaction error? SPI Configuration Lockdown activated.. bugger. The two jumpers I’ve tried are on the left top side, near the 4 USB sockets.. Currently running Chrbuntu and got flashrom with a apt-get install flashrom (noticed it doesn’t have the –wp-disable flag supported). Any ideas? I’ll keep trying to hack away at it. You could also post a pic of your board? I’ve seen a number of models at this stage, so I know the kind of thing to look for. I’ve flashed your test build (coreboot-stumpy-youaintgettingit.rom). It tries to boot Chrome OS from the mSATA SSD and fails. That was expected, but I’m unable to boot from USB as well. The boot menu shows both the internal SSD an the USB thumb drive. After selecting “2” (USB) it gets stuck at “Booting from Hard Disk”. Removing the write protect jumper doesn’t help. As next step I plan to replace the SDD with one that has Debian or Ubuntu preinstalled. Do you have any further tips? Have you managed to boot the USB stick on another machine? Yes, that’s a good next move. Possible problem with the SeaBIOS I have in there. I think the version of SeaBIOS in that build has a problem with external keyboards. I’ve updated it to 1.7.5. I’ve also added a “links” file which will automatically cope with the different PCI id’s that Stumpy has for the graphics card i.e. 8086:0106 and 8086:0126 so you can flash it using the script once you get your distro on there. Today I was able to boot my i5 Stumpy box by putting in a preinstalled SSD. Immediately after that I’ve tried your new script, but it has failed. The -m1 is necessary, because grep finds “Product Name: Stumpy” twice. Finally all is working fine, including Standby and USB-Boot, even using unetbootin created sticks. Thank you very much John. A PayPal Donation will follow shortly. Thank you very much for that, and your amazingly generous donation. I’ll update the script in line with your fix. 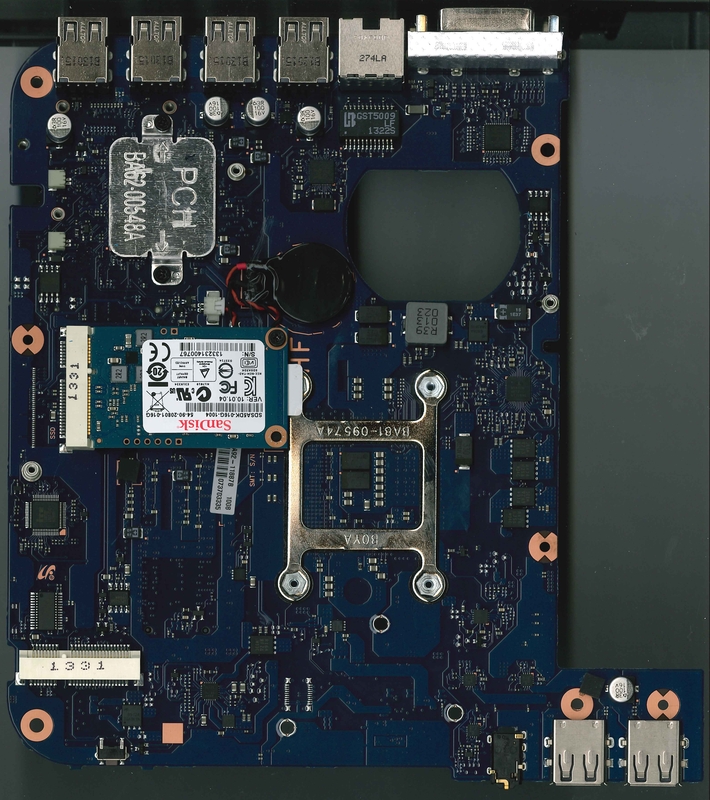 Is it now possible to flash a chromebox serie 3 with a core i5 from google I/O ? I realized that i must disable write protect by closing a circuit on my board , I’ve opened it , and everywhere it says the jumper on stumpy is between the memory and the battery , which clearly it doesn’t have battery . so i’m a bit puzzled , the jumper on series 5 550 looks alot like the speaker connector of stumpy :D lol. probably Christian Reischl , can put me in the right path ? You can see the jumper labelled in this photo. I used a small watch screw-driver wedged between the pins (careful not to bend or break them). HTH. 3) And at the bottom-left corner of the white cube there are two dots. I will call them 5 & 6. I have shorted 1 & 2 (didn’t work) and then 3 & 4 (didn’t work either). which means write-protect switch’s current position is 1 (ON). Can someone help on how to short the jumper? Which two pins are correct in terms of 1,2,3,4,5,6 described above? It’s the two pins which are in the white cube. I used a small watch screwdriver to gently wedge between the pins and provide the circuit. I don’t know what you mean about other pins because AFAICS those are the only two pins around. Are you looking at this picture? Hi thanks for the reply. I finally got it working. Yeah I later realized two very important things (maybe they are obvious but took me a while to figure out). 1) The pins are “inside” the white cube (obstructed from view). 2) Also very very important for n00bs like me …. you have to execute flashrom “while” the screw-driver is wedged and the circuit is shorted. It wont work if you short it and then release it and then go back to console/terminal. Since this is 2015 a few things have changed slightly in coreboot compilation. 1) “Mark Graphics memory as write-combine” — is now automatically assumed and they decided not to make it explicit in menuconfig. You will no longer find it. 2) ‘Cache system ROM’ option was reportedly causing more trouble than help. Due to other speed improvements and due to the buggy nature of this option, they removed it from menuconfig. You will no longer find it. 3) It is also recommended to do a “make crossgcc” before doing “make”. The crossgcc target generates a dedicated toolchain for coreboot compilation and avoids using the toolchain in your Linux distro. This is because, various Linux distros patch their included toolchain in peculiar ways which is known to cause some issues in coreboot compilation. As a result “make” will quit with an error if you don’t do “make crossgcc” first. However if you are 100% confident with your local toolchain, you can set the env variable CONFIG_ANY_TOOLCHAIN = ‘y’ and it will work. “make crossgcc” takes a long time and the arm toolchain generation (absolutely not necessary for Samsung 550) is broken. But you can make it work by simply excluding the arm target in makefile. Sorry about rambling but wanted to document these for any future adventurer. Overall, thanks John for the detailed write-up. I didn’t have a laptop and am short on cash. I got the Samsung 550 for $99 from ebay, upgraded the SSD to 64G for about $20 (also from ebay) and installed Xubuntu. Seriously it feels like an expensive Macbook Air. Well, I don’t know if there’s much point in documenting the changes, as the information will become stale quite quickly, but I’ll leave it here on the off chance some of it remains relevant. Yes, the 550 was the quickest Chromebook (outside of the prohibitively expensive Pixel) before the Haswell’s made it onto the scene. I was very happy with it. For that kind of money, it’s a steal, as it’s pretty good quality. I saw that you have custom built firmware for Peppy (Acer c720p) . I am trying to do the same, but all I end up with is a bricked system. Can you share the core boot menuconfig options for Peppy ? The .config is inside the ROM’s, you can extract it with cbfstool. HTH. I could extract the config from the original BIOS , but still land up with a bricked system. Is there a way in core boot to check that the config file loaded during menuconfig is the one actually used during make ? It is the one used during make. It’s inserted automatically by the coreboot make system. There’s probably something wrong with one of the binaries you’re using. Either that or you’re trying to build for Baytrail which very few if any have been able to do successfully. Do you build on x86_64 system? If so, try to use clean x86 32 bit system. I had the same issues when building on 64bit host, nothing worked, always got black screen. Now I use clean ubuntu 14.04 32 bit host for build and the same .config is booting now . I used the latest coreboot git (420b0f6), its working. Just be sure to use the coreboot cross compiler (do ‘make crossgcc’ after doing the ‘make menuconfig’). Also check if you have the correct VGA id (pci8086,0a06 for peppy) or a appropriate “links” file in your cbfs. I can update the bios of the PC with the 5 Series describing here SAMSUNG SERIES 5550? puedo actualizar el bios de este pc con el de la serie 5 que describe aqui SAMSUNG SERIES 5 550 ? and that is not the one that you have above, so is this wrong? Well, it’s a different file, so it will have a different checksum. If you look in the same location you downloaded the file for “lumpy.md5” you’ll see the md5 for the file your using in amongst the checksums for all the others. Thanks for the quick reply, I went ahead and flashed it but got a ‘FAILED’ message. so I re-flashed my backup just to be safe. What am I doing wrong for me to get that failed message? Nothing, as long as it’s the “spi_block_erase_20 failed during command execution at address 0x0|Verifying flash… VERIFY FAILED at 0x00000062! Expected=0xff, Read=0x0b, failed byte count from 0x00000000-0x007fffff: 0x4|Your flash chip is in an unknown state.|DO NOT REBOOT OR POWEROFF!|FAILED” error. That’s part of the firmware descriptor which can’t be overwritten. How do you know that ROM is any good, BTW? Well I do have that exact error. But it is your ROM so I trusted it, should I not? No, you shouldn’t. Just because it’s up on the server, doesn’t necessarily mean it works. Unless you have a very good reason to (like somebody else told you that a particular ROM has a feature the latest ROM doesn’t) you shouldn’t go installing ROM’s willy nilly. The script is there to make flashing as safe as possible, and take human err/guesswork out of the equation.